Last September Haven Duddy of Main Line Haven asked me to be a guest on her beautiful blog and break it down for her clients...how to navigate the different kinds of window treatments so you can choose the style that is right for you. I wanted to share the information from my post here on my blog as well! Main Line Haven is a gorgeous one-stop shopping destination if you are looking for real estate, construction or interior design services. Haven has is all covered and does so beautifully. Patrick Duddy, Haven's husband, owns Duddy Construction and they do amazing work. I see his work on a regular basis and I am always impressed with the quality and the fact that his clients are always happy with the experience which is equally important and so key! Check out Haven's blog, I promise you will love it! So here is my guest post below - ENJOY! You want to ease the excruciating pain of doing the dishes at 10 pm after a long day? You can do just that by adding a pretty custom window treatment above your sink to enhance your view while you tackle the inevitable. If you have recently completed a beautiful kitchen renovation, your quality of life has been enhanced quadruple-fold by the space’s amazing aesthetics and increased efficiency. Kitchen’s are the heart of the home, so let’s give it that polished look with some new window duds! Custom window treatments are an investment so the window over your sink is the perfect place to do a custom treatment since it’s typically just one window. While the trend in kitchen design continues to mix simple clean lines with a calming white and gray color story, you can take a little risk here if you long for a bold print or a bright color. If you prefer the monochromatic vibe, you can add texture and details by selecting natural materials or by adding tape details to solid linen fabrics. This area is usually a focal point in the kitchen so using a “statement piece” in this spot can showcase your style. Custom window treatments are similar to the high-low in fashion where it makes sense to invest in special pieces and pair them with affordable basics to achieve your look. FABRIC ROMAN SHADES are one of the top trending styles going forward and they are always in style. The options are endless since we can design anything you want! There’s the classic flat Roman, the soft and relaxed versions, or you can even get away with a “mock” Roman valance which requires less fabric and labor. If privacy or light control isn’t a priority, you can still use that pricey fabric you’ve been obsessing about. WOVEN WOODS, also known as bamboo or matchstick shades, are essentially Roman shades made out of a woven wood material. The varying weaves let light filter through and you can also order a liner if needed. If you are a boho lover at heart, these need to be yours. They are textural and come in lots of colors, even gray! 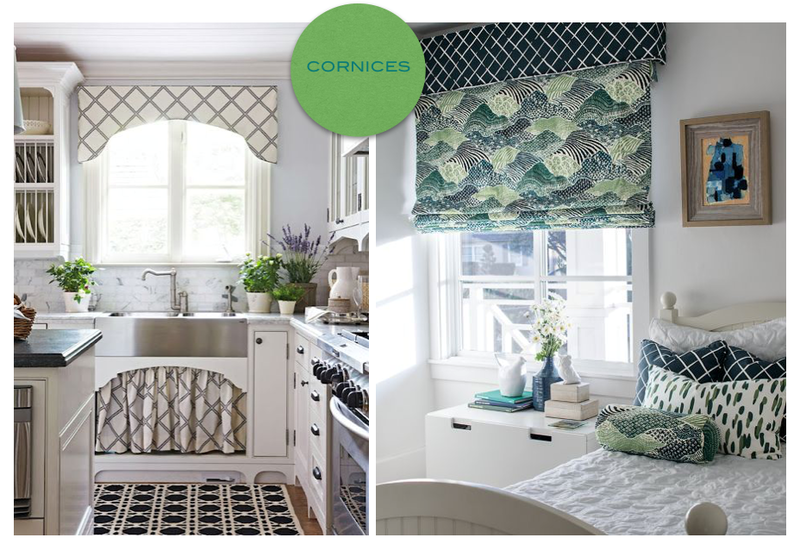 CORNICES are upholstered wood valances. They frame your window and can also be combined with other treatment styles. You can use contrasting trim and tape details to add interest. This option is budget friendly but still makes an impact. 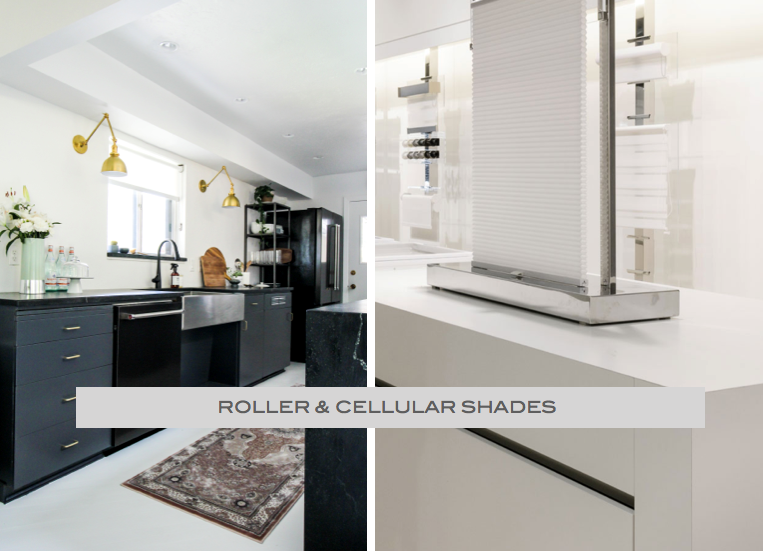 ROLLER AND CELLULAR SHADES are great if you are a minimalist design lover. They are modern, simple, clean and bright. They do the job and virtually disappear when not in use. So now that you got a crash course on the different styles, you can get to work on your project. If you want to set up a consult for your home, visit our website and fill out our contact form and we can get started! www.claudiaclobes.com/contact. Decorating your home is so much fun and new window treatments will be a life changer. Have fun! Thank you Haven for having me as your guest! Main Line Haven provides services, resources and inspiration for real estate, construction and interior design along the Main Line. To learn more about Main Line Haven, visit her about us page or watch our video.